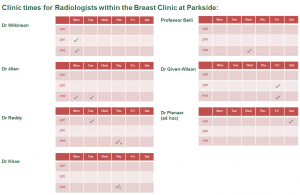 The Breast Clinic at Parkside Hospital offers a comprehensive and personalised breast care service, covering everything from diagnosis to treatment, all in one location. The Breast Clinic is Bupa accredited whereby all our services are consultant-led with the support of a multidisciplinary team of radiologists, reconstructive plastic surgeons and breast care nurses. This specialist team ensures we can provide a rapid diagnosis through the highest standard of testing, personalised screening, consultation, treatment and aftercare. 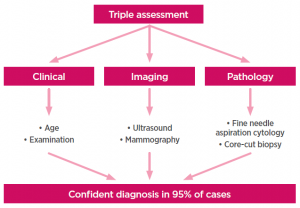 The ‘One Stop Breast Clinic’ at Parkside Hospital can offer a triple assessment to ensure a thorough and accurate breast cancer diagnosis. Upon arrival, you will be seen by the specialist breast surgeon who will perform a clinical assessment comprising a full history and examination to guide the necessary imaging. The consultant will identify any potential problems through a series of diagnostics procedures called a Triple Assessment. This includes imaging (mammogram and/or ultrasound), clinical examination and biopsy, although this may not be necessary for everybody. During this ‘One Stop’ approach, the service can quickly assess whether a lump is benign or malignant, reassuring 90% of patients immediately that their lump is benign and no further diagnosis intervention is required. Should the investigations reveal a more sinister cause of symptoms, this is usually confirmed within 2-5 working days and the patient will be informed of the diagnosis during a consultation in the presence of a breast care nurse. The findings will be discussed and a personalised treatment plan specific to you will be formulated of which the relevant treatment course can be fully carried out on site. The ‘One Stop Breast Clinic’ at Parkside Hospital has been recognised as ‘an area of outstanding practice’ by the Care Quality Commission (CQC) and aims to cause as little disruption to a patient’s day as possible, offering the ultimate one stop approach to reduce fear and provide early diagnosis and the prompt treatment women need. If your doctor has referred you for a mammogram or ultrasound, please call our Imaging team on 020 8971 8000 ext. 8470. If you are non-symptomatic, but want ease of mind, you can self-refer if you’re over the age of 40. Call 0208 971 8025 to book your appointment. You can choose to see any of our consultants at Parkside Hospital. For any queries or appointments, please call 020 8971 8025.